Are you a logger, tree care professional or owner of a large property? Choose a chainsaw built for demanding work. As a true professional saw with enough power for longer bar options, the Husqvarna 372 XP® is ready for the toughest applications. The crankcase and crankshaft are extra durable, while the carburetor’s vibration dampening can handle high speeds and heavy workloads. 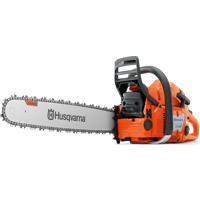 Featuring a powerful X-Torq® engine, this chainsaw is the ideal combination of high power and low weight. Air Injection – Centrifugal air cleaning system removes larger dust and debris particles before reaching the air filter. This results in reduced air filter cleanings and improved engine life. X-Torq – Delivers lower fuel consumption and reduced exhaust emission levels in accordance with the world´s most stringent environmental regulations. Adjustable Oil Pump – Allows you to control oil flow depending on application and weather conditions. Quick-Release Air Filter – Facilitates cleaning and replacement of the air filter. Side-mounted Chain Tensioner – Easier access to chain tensioning device. Magnesium Crankcase – Sturdily built crankcase withstands high rpms and tough professional use, ensuring a long service life. Quick Release Air Filter Cover – Quick release cover saves time when cleaning or changing spark plug or filter. Three-Piece Crankshaft – Forged three-piece crankshaft for maximum durability for the toughest applications. LowVib – System designed to reduce vibration levels to the operator, which lessens fatigue. Smart Start – The engine and starter have been designed so the machine starts quickly with minimum effort. Front Handle Ergonomics – Better grip and a 7 degree offset handle reduces fatigue. Inertia Activated Chain Brake – Reduces the likelihood of injury due to kickback.